The Battle of the Lamp! 28-inch tall soft tinsel display can be used indoors and out! Based on the comedy film A Christmas Story. Includes 35 lights, a 36-inch lead wire, and bulb. 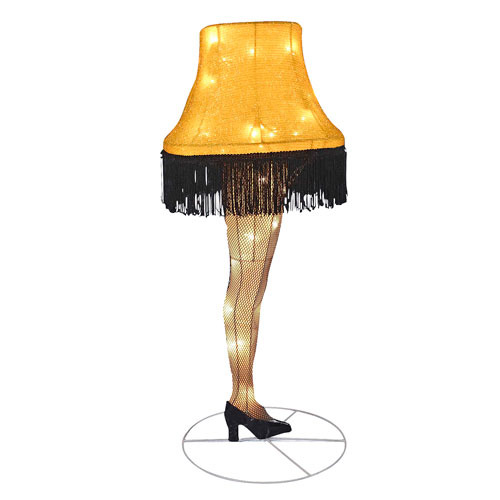 Display this 3D leg lamp soft tinsel sculpture indoors for family and friends, or outdoors for all the world to see. Based on the comedy film A Christmas Story, it lights up! The A Christmas Story Leg Lamp 28-Inch Light-Up Tinsel Display has wiring on the bottom that makes it easy to set upright on your lawn, and it includes 35 lights, a 36-inch lead wire, and a 3.5V 0.12A incandescent bulb. Ages 14 and up.